Patti wrote: Dukes in reference to the Fire hand shape says "This is, in the West, by far the most common handshape." Thanks for refering to Dukes. I am glad to see (and become aware again) that Dukes' guidelines regarding the palmar shape are actually much more detailed than the superficial talk about squares vs. rectangles that we usually find in the books. Dukes points out that even the overall size of the palm provides a clue about the element involved. And this implicates that one can not simply judge the palm without considering the length of the fingers as well - see figure 10: where Dukes presents the 4 hand shapes by four hands of equal length! 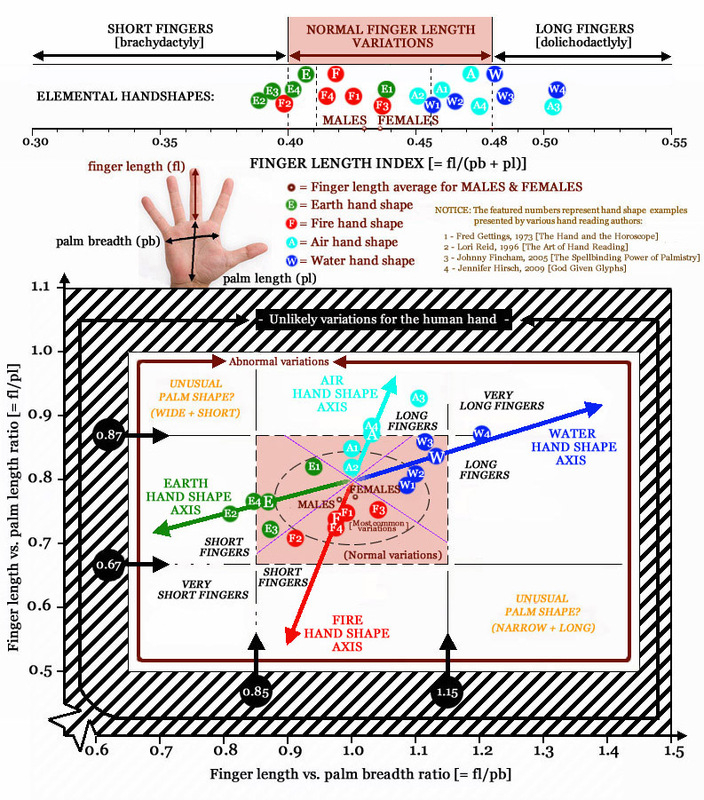 And I think it is very interesting to notice that figure 10 shows why finger length in the earth hand shape is typically a bit longer than the finger length in fire hand shape. Because Dukes' example for an earth hand shows that the finger length in the earth hand is not much shorter than in the air hand and fire hand...! And by the way, the picture also shows that the width of the fingers appears to be another element that can be used for a detailed assessment (though that sort of goes beyond my interest right now). Wow... Dukes's materials fits with my suggestion that only fire hand shape should have a requirement regarding finger length versus palm length! By the way, now I sort of also understand why Fincham started working with a percentage as high as 87.5%. I guess it was his teacher (Dukes) who presented a guidelines describing an even higher percentage... as he describes that "finger are either longer or shorter than the palm" (page 43) - which suggests that the percentage could even be as high as 100%. But actually, I think Dukes' guidelines are quite hard to follow when finger length is sort of normal (near the discriminative criterium being used) compared to palm length. Because then how to decide whether a palm is 'narrow oblong' (water palmar shape) or 'large oblong' (fire palmar shape)...??? For me it is quite obvious that Dukes's method then becomes a mission impossible without the consideration of finger length versus palm width. There is no way to find this out without this specific consideration. Patti, thank you very much! Because now I realize that not only the work of Gettings fits perfectly with the suggestions that I found in the 'format' that I am working on, also some fundamental issues described by Dukes regarding the individual hand shapes confirm that finger length versus palm width is just as important as finger length versus palm length. Only, I guess it requires some thinking 'out of the box' in order to understand this fundamental issue. Lynn, would you mind to take a look at the following print? What would be your assessment at first sight? And what would be your assessment based on measurements? Martijn, could you check your measurements? I printed it out because I can't measure from a screen (screen resolution makes a difference). I made earth finger 7.5. We can't see the base of the hand, but it is at least 10cm long. So I made f. length vs palm length = 75% (or maybe less), with square-ish palm = earth hand (all the authors you quoted would take those measurements to be an earth hand). I already mentioned that we do take palm width into account for palm shape and combination hand shapes. Martijn (admin) wrote: However, have you considered how Ed Campbell described that the 'mixed hand' in d'Arpentigny's system should probably not be understood as a 7th hand shape next to the other 6 hand shapes. I guess Ed would probably agree with me if I say that the 7th hand type was probably d'Arpentigny's way to say that most people tend to have a combination of the other 6 hand shapes that he described. Yes some hands are difficult to define, in which case there is nothing to say about handshape. As I said before it is only really worth commenting if they have archetypal earth, water or air shape, or a combination that can be defined. I think the picture Johnny gives is actually a combination fire/air hand ( palm is more squarish than oblong, earth finger is about same length as width across centre of palm). But his book is for beginners, he couldn't possibly go into all the combinations. So what he's saying here is that - if you can't tell what shape it is, just go onto the next feature. As I've said, I don't know why Johnny is using 87.5%. But as I said before, it is a spectrum, so eg 'pure' fire hand shape with 75% fingers. If the same palmar shape had 80% fingers that adds more air element than a standard fire hand. I think you have completely misunderstood this paragraph! No, it is not all in the perspective of discussing handshape. He says "no-one is an absolute pure type" and he is talking about that "a dominant facet of each type is in all of us", and "this would be a very short book if everyone's hand fitted neatly into one of these four categories". He is talking about elemental type, not about handshape. If you take the whole quote n context, he says "the above are pure archetypes and make for rather simplistic readings. No one is an absolute pure type, though a dominant facet of each type is in all of us. These examples are where all the palmar qualities of each element are present so not only does the hand's outline conform to a definite elemental shape, but this is reinforced by the corresponding skin thickness (...) and lineal quality. This would be a very short book if everyone's hands fitted neatly into these four categories....."
so he is not just talking about handshape, he has included skin texture and line qualities - and he is saying that most hands will NOT have all the various features being the same elemental quality. If that were the case he would have a short book of just this one chapter that contains four archetypes. "The Shape of things to come" is introducing the fact that we need to look at all other aspects of the hand which then follow in his book. Patti wrote: Your hand sample above is a good one for a rounded palm. The palm is quite wide, but that will not appear in your measurements as in your system you will be measuring the width at a more narrow location. Dukes places such hands in a category of their own and also notices that the 'corners' are rounded and the earth energy is somewhat lost. Thanks for reminding me about Dukes' unusual handshapes. I see what you mean about rounded palm, though the radial side of the print seems to be missing so we can't tell if it is actually round. But there are some unusual features on the print that Martijn presented which seem to fit with Dukes' description about circular palm (and other features that I have seen before...) Martijn does this person have some learning disability? that would be an interesting experiment Patti! Martijn (admin) wrote: Dukes points out that even the overall size of the palm provides a clue about the element involved. And this implicates that one can not simply judge the palm without considering the length of the fingers as well - see figure 10: where Dukes presents the 4 hand shapes by four hands of equal length! 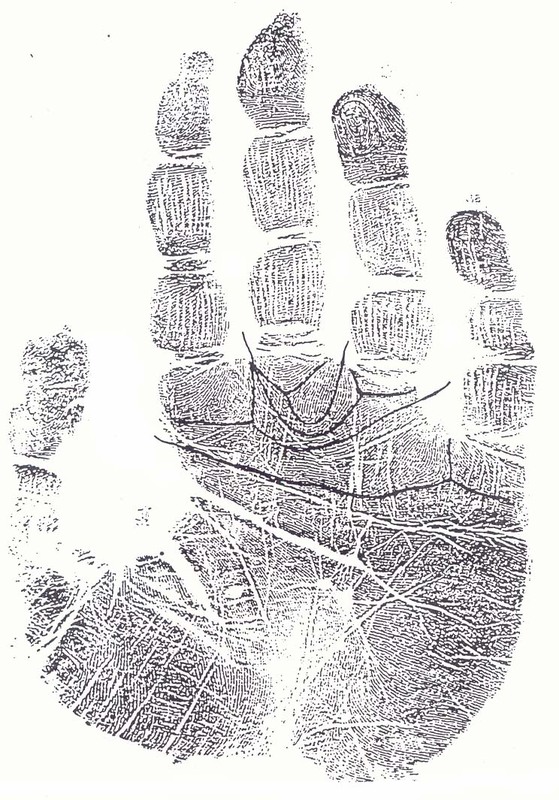 Patti wrote: Peter West in "The Complete Illustrated Guide to Palmistry" took another approach. He describes the various systems of hand shape and lets you decide, if the hand doesn't fit in one system - try another. I agree with his comment that the 4 elements approach is nicely condensed but too narrow and doesn't allow for variations within the hand. Which is my argument as well. I disagree Patti. The elemental approach allows for all variations within the hand! Here we are just talking about basic handshape. But as I said it's like doing a jigsaw, all other aspects of the handshape and all other parts of the hand can also be assessed via elemental methods. Well... with the help of Lori Reid's examples I think I have been able to make a huge step ahead! And I never thought that this quest would result in anything like is seen in the picture below, but it looks to me that the 'hand shape axes' (looks like this is going to be the new essential concept that I would like to propose for adoption) pretty accurately and precisely describe where the four hand shapes are typically found in the perspective of the finger length ratios. By the way, the picture includes a fascinating element... because for me it is quite surprising to see how the mid-point of the 4 axes is found at the finger length location: 0.8 for hand length + 1.0 for hand breadth. NOTICE: The purple lines resulted from the narrow zones between the 4 groups, and the crossing point of these purple lines represent the starting point of the 4 axes. And each of the 4 axes are drawn from the midpoint through the average location (see the buttons: E, F, A, and W) of the 4 examples that Gettings, Reid, Fincham & Hirsch have presented for each hand shape. Lynn & Patti... I hope you will enjoy to see this new result as much as I did! By the way... maybe we can now even see which of the 4 authors presented the best examples. Interesting to see that Jennifer's buttons (no.4) are all found positioned at the 4 axes! Does it help if I give you the combination hand shapes? Looking at length of earth finger compared to width of hand enables you to differentiate between different types of fire combination hands. (remember we measure it across the centre of the palm). classic fire hand proportions - 10cm palm length, 8 cm palm width, 7.5 cm earth finger. Air hands generally have a larger square palm than earth hands. Fire/Earth - earth finger is shorter than width of palm. Palm is wider than you would expect in standard fire hand (squarer), earth finger is still 75% length of palm, but same as width of palm. Fire/Water - palm is slightly narrower than you'd expect in a fire hand, earth finger is still 75% length of palm but same as width of palm. OR standard fire palm with medium fingers 80% length of palm. Earth/Air - it was argued that earth/air combination doesn't exist, but it does! square palm with fingers around 80% length of palm. By the way... guess what Lynn? In my new picture the coordinates for the large 'F' button (which represents the average of the 4 fire hand shape examples presented by the authors)... are not far away from the coordinaties resulting from the 'classic fire hand proportions' that you just described. (The coordinates resulting from the proportions that you described for the typical fire hand are: 7.5 / 8 = 0.94 and 7.5 / 10 = 0.75; while in my notes the coordinates of the (average) F-button are: 0.97 and 0.73). I hope this will help you recognize and understand that my new pictures now sort of confirm your conclusions regarding the key-features of the classic fire hand! Thinking about this a little more... maybe the E, A and W button could very well turn out to be a good representive as well for the typical dimensions of in respective an earth hand, an air hand, and a water hand. Does this makes sense for you as well? Do you have likewise coordinates for the other hand types as well? For, it would be very interesting to compare them with the results that I found. Your water and air examples are on the axes that I presented for those hands in the new picture. And your combi-examples are sort of located where one can expect them according the axes: between the axes. By the way, your fire-air combination is quite fascinating: because those coordinates are found at the starting point of the axes... and this perfectly makes sense: for, those 'opposite' elements can not be expected to show up elsewhere (when assuming that the axes are correct). Sounds to me that we sort of both arrived at the same fascinating discovery Lynn! I always told you that 5 element hand analysis was fascinating! So basically you have found agreement now that you have Lori's sample? Martijn, could you add Lynn as Example 5 so we can see on the chart how what she is sharing relates to the others. I expected Lori to be #4 but you said that you made Jennifer #4. Could you also give a legend to your chart? Patti wrote: So basically you have found agreement now that you have Lori's sample? by the way Martijn, axes better fits the plural of axe which is kind of like a hatchet and chops things up. I think you mean axis? But then again your axes might be cutting the elements at an axis. Patti wrote: Martijn, could you add Lynn as Example 5 so we can see on the chart how what she is sharing relates to the others. I expected Lori to be #4 but you said that you made Jennifer #4. Could you also give a legend to your chart? Patti, regarding the legend... it is available in the picture - see at the right side of the hand. Regarding adding Lynn to the chart, I prefer to continue working here with materials that have been published (I prefer to avoid hat the result might get an obscure character when unknown examples get included etc. - I hope you understand). Actually Lynn, you should now be able to 'read' the answer from the picture! But I guess... maybe.... Lori's examples sort of gave more 'direction' to the earth-axis and fire-axis; which probably helped me to find my 'eureka' moment regarding how to make a clear presentation for these materials. But I think the other hands have had likewise weight in this process. So, hand examples from another book might have had the same result. Because, Lori's examples only had a significant influence on the direction of the axis for 'fire hand shape'. Patti wrote: by the way Martijn, axes better fits the plural of axe which is kind of like a hatchet and chops things up. I think you mean axis? But then again your axes might be cutting the elements at an axis. Do you have any info available to illustrate your point? Lynn, I would say that the red one above ... is probably 'earth'. Could that possibly be a better option? PS. Your other examples perfectly make sense in the perspective of the axes - I think this model works very well. I think there is one more discrepancy. tap wrote: I think there is one more discrepancy. Sorry, I don't see much of a problem regarding those first 2 examples, because they are clearly both in between the fire axis and the water axis. Quite a different situation compared to Lynn's '0.83, 0.75 - earth/fire' example... because those coordinates are very close to the earth axis + at a very large distance from the fire axis.